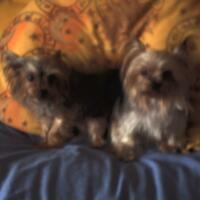 I have 2 lovely cute Yorkshire Terriers that i love very much! Yorkshire Terriers as you can see are lovely little dogs that are more like puppies in every sence of the word,, but you at least know that if you need to be protected in anyway they'll be there for you as your trusted little guard dog, all they ask from you is a little love and affection and a space on your lap and some (TLC). A picture showing who's the boss !! Although they sleep alot, eat very little, bark/yap , when it comes to house training they take much longer to train than most other dogs, as they have very little muscle control and this is the reason for the training taking longer so always make sure you have plenty of paper to hand for little accidents.